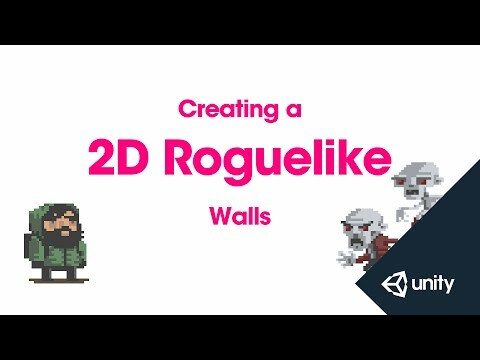 This is part 7 of 14 of the 2D Roguelike tutorial in which we write the Wall script which will allow the player to damage and destroy the walls. public AudioClip chopSound1;                //1 of 2 audio clips that play when the wall is attacked by the player. public AudioClip chopSound2;                //2 of 2 audio clips that play when the wall is attacked by the player. public Sprite dmgSprite;                    //Alternate sprite to display after Wall has been attacked by player. public int hp = 3;                          //hit points for the wall. private SpriteRenderer spriteRenderer;      //Store a component reference to the attached SpriteRenderer. //Get a component reference to the SpriteRenderer. //DamageWall is called when the player attacks a wall. //Call the RandomizeSfx function of SoundManager to play one of two chop sounds. //Set spriteRenderer to the damaged wall sprite. //Subtract loss from hit point total.